Sunday 28th’s kata course for Instructors with Jonathan Mottram, “12 times English Champion”, safely fulfilled all expectations, if not exceeded them. Lasting for two hours, the class’ versions of Jion and Kanku Dai were dissembled and brought up to scratch, hopefully adding insights into kata as a whole whilst coming conveniently not too long before the much awaited MSKF Championships. Many thanks must go to Sensei Mike Judd, for arranging the day, which everyone thoroughly enjoyed, and learnt from- as proved when Jonathan was instructing, or demonstrating- the dojo has never been so quiet! One thing Mr Mottram mentioned was how he never switches off from thinking about karate, or how to improve his technique and get his point across, and that a good karateka acts like this- I’m sure various spare chairs around Staffordshire were used as impromptu karate aides as soon as everyone got home! As Sensei Paul Smith pointed out, Jonathan’s sharpness was obvious, increasing the effect of the kata and also adding realism. It was something he picked up on himself; not only the speed of techniques is important, but feeling is essential to good katas, and this was evidential in his demonstrations, inspiring the class at the end to give it a go themselves with Kanku Dai. Various training techniques were called upon, with partner work included, lightening the atmosphere and allowing the class to put what they had seen into action. Certainly sharpness increased amongst the ‘student’ Instructors present when threatened with their partner (or supposed mate) slapping them if they didn’t move quickly enough! Hopefully, activities like these will be incorporated into usual training sessions, especially children’s classes, allowing them an effective but entertaining way of speeding up and staying focused! Another important aspect of the course was the emphasis Jonathan gave on completing the technique together, i.e. 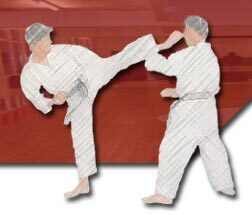 not landing the foot eons after the block or strike has been executed. Hikate was given a prominent position in this section, with the importance of involving the hips in a technique shown; the benefits this can give suddenly became apparent! The class’s yokogeris were given a thorough seeing to, with a clever activity preventing the student from leaning back or forth too much, whilst having to lift their leg up before firing their kick, and bringing it down the same way getting great results! Some students really excelled at this, and the beauty is other katas such as Hiean Yon Dan and Sochin include the sequence, so the class has ample opportunity to use what it has with any luck learnt. Overall, the time for once really did fly by, and the succinct, accurate but above all interesting lesson from a real life kata champion ended on perhaps the best possible high note- a rousing performance of Unsu. This course left all who went with much to ponder, but certainly a view of just how easy it is to turn a good kata into a fantastic one, and a fantastic kata into a winning standard. Jonathan led a brilliant session, so recognition must be given for letting us at MSKF have a taster into kata at its highest level-next year can’t come quick enough!